To bind fats and cholesterol in food. To aid bowel cleansing and purging. Microfine Luvos Healing Earth can bind and excrete cholesterol and fats from food like a sponge. The bound cholesterol can not enter the bloodstream and settle on the vessel walls. An active, conscious lifestyle with a healthy nutrition, plenty of exercise and little stress also helps to lower cholesterol levels, thus reducing the risk of heart attack and stroke. Since an elevated cholesterol level promotes the process of arteriosclerosis (vascular sclerosis), it is considered to be one of the primary risk factors for cardiovascular disease. An active, conscious style of living including a healthy diet, much physical activity and little stress helps to maintain a favourable cholesterol level and thus to reduce the risk of myocardial infarction and stroke. Microfine Luvos Healing Earth can absorb cholesterol, fats and harmful substances from food like a sponge, bind them and effect their excretion. Once bound, dietary cholesterol can no longer get into the circulation and be deposited on the vascular walls in the form of plaques. Luvos Healing Earth is further capable of binding bile acids in the intestine and thus increase their excretion. This is a natural way of stimulating the formation of new bile acids. Since bile acids are built from cholesterol, healing earth can thus exert a positive influence on the cholesterol level. As a naturopathic agent without side effects, Luvos Healing Earth helps you keep a heart smart diet. A special, gentle milling and sifting procedure using modern ultrasound technology achieves the high binding capacity of microfine Luvos Healing Earth. Luvos Healing Earth is also suited for internal purification, i.e. helping to improve the intestinal mucosa and flora and cleansing. It relieves gastrointestinal complaints manifested as gastric pressure, sensation of fullness and flatulence. Using the gentle force of nature, Luvos Healing Earth relieves the metabolism and helps to restore the natural balance in the stomach and intestine. Naturopathic microfine Luvos Healing Earth can be used for extended periods of time. Adolf Just (1859 - 1936), a pioneer of naturopathy and discoverer of Healing Earth, was committed to a healthy, self-reliant lifestyle in harmony with nature. An active, conscious lifestyle with a healthy nutrition, sufficient exercise and little stress helps to influence the cholesterol level positively. A too high cholesterol level is one of the most important risk factors for heart disease in addition to smoking, physical inactivity, diabetes, hypertension and obesity. So everyone can do something for themselves to reduce their personal risk of cardiovascular disease. The best way to prevent too high cholesterol is in the kitchen, since a part of the blood cholesterol level comes from the food. A balanced, calorie and fat-reduced diet decreases the risk of high blood lipid levels and at the same time reduces excess weight. High cholesterol foods should be avoided, general fat intake reduced and fats with high levels of polyunsaturated fatty acids should be used. Vegetable fats such as olive oil or rapeseed oil contain unsaturated fatty acids that reduce cholesterol. Animal fats like butter and lard, on the other hand, contain a lot of cholesterol. An exception is fat fish such as salmon or herring. It contains healthy omega-3 fatty acids. A tip: The more liquid the fat, the healthier it is usually. According to the recommendation of the German Nutrition Society, we should eat a maximum of 60 to 80 grams of fat per day. Mostly we lie about it. Therefore: replace animal fats with vegetable fats, prefer low-fat dairy products. For meat, select lean types, drain the fat and remove the fat margins. Low-fat preparation methods are steaming, stewing and frying in coated pans. These plant components swell up and promote digestion. In particular, water-soluble fiber can bind bile acids and then excrete them via the stool. Whole grain bread, vegetables and fruits are recommended. Obesity is considered a risk factor for high blood pressure and is often associated with high cholesterol. A balanced, calorie-reduced nutrition and exercise help to reduce and prevent obesity. Whether a vigorous walk or regular cardio exercise - exercise can have a decisive influence on the fat metabolism. Those who do sports demonstrably reduce their risk of cardiovascular disease. 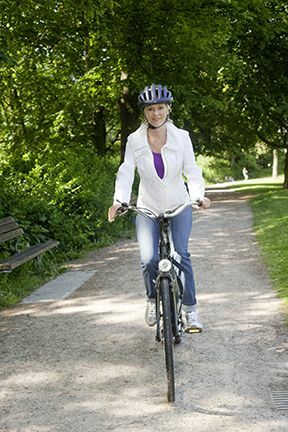 Several times a week about 30 minutes of endurance sports such as walking, swimming or cycling are ideal. But also in everyday life can be incorporated movement units: stairs instead of lift, bike instead of car, walk instead of bus ride.